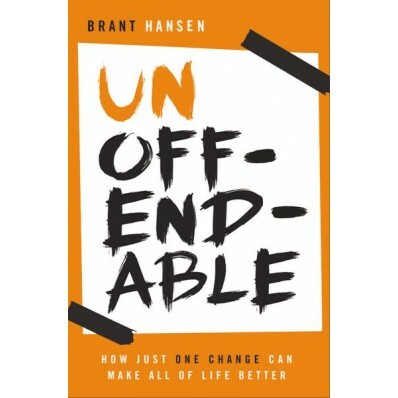 I’m about a third of the way through Unoffendable: How Just One Change Can Make All of Life Better by Brant Hansen Show host Brant Hansen. It’s probably lighter reading than many items I cover, but it’s what I need right now after a rather hectic fall season in which my reading schedule went totally out the window. The book in a nutshell: Christians should not be easily offended. American church culture, generally speaking, does not encourage this sort of restfulness. Quite the opposite, actually. Instead of inviting people out of the exhausting storm of busy lives, we add to their loads. We give them even more to do, or prompt them to feel guilty about what they’re not doing. How do I know this? I’ve done it. I was good at it. “Great idea,” I said. And that week, I made a very awesome pie chart called the “Discipleship Wheel,” broken into eight different parts, to distribute to all of them. I used a computer. I was proud. It was very professional looking. I can’t remember what the other thing was. Something super-important. I saw Mike – he’s now an engineer and a father of six – not along ago and I told him how sorry I was, and we had a good laugh. Thankfully, he now has a better picture of just how good God is. He now knows that God did not call us into Pie-Chart Life, however smart-looking the chart. God wants to know us. Check out The Brant Hansen Show on these stations, enjoy the selected wisdom of Brant (and producer Sherri) in 20-minute segments on his Oddcast; or follow him on Twitter. Unoffendable is available in paperback from Thomas Nelson. I decided to go to Google to see what people are saying about it. …No doubt you’ve seen a picture of Michelangelo’s most famous painting on the ceiling of the Sistine Chapel, “The Creation of Adam,” in which he portrays God and Adam with their hands outstretched toward one another. God is leaning and straining toward Adam, and his fingertip almost touches Adam’s hand, which is more relaxed, not nearly as intent on its mission. The very hand of heaven reaching for the hand of man. …If you’re not in the daily habit of reaching for God’s hand and listening for his agenda, let me offer you a challenge: Find a spot in your home—for me, it’s a wooden rocking chair by the fireplace—and sit there for fifteen minutes a day, connecting with God. Read his Word, open up your life to him, and listen for his whispers. When you’re in that chair and you’re in a right relationship with God, it secures your identity. It simplifies your agenda. You won’t be so tempted to run out and do all the other stuff that doesn’t matter a hill of beans to God. So, chair time. Start there. ..Because you are reading a book about simplifying your life, I’m going to go out on a limb and guess that you are in a season of throwing away clutter. You are throwing away commitments on your calendar that don’t fit your values. You’re throwing away the financial habit of living beyond your means. You’re tossing some shallow or harmful relationships in favor of deeper, more life-giving relationships in Christian community. Through the hard work of self-evaluation, you are in a season of clearing out and clarifying. …As someone who faith has been a part of my story in one form another for a long time, I’ve known the value of what we call ‘devotions’ or ‘quiet time’ or any other verbiage we’ve given to it over the years. It’s huge. It’s great. But the truth is, I’ve struggled with consistency time and time again. I have gone through seasons where I’m strong, and seasons where I’m spotty. At best. Since looking at it SLIGHTLY differently through the lens of ‘chair time’- that’s seemed to be helpful for me. For whatever reason. Maybe your chair time is at a coffee shop, your breakfast table, living room coach, your office, or during your commute. It could be morning, afternoon or evening. Your chair time will change your life and help you gain perspective. What do you say…will you find a chair? A variation on this story appeared yesterday at Christianity 201. So last weekend our friend Brenda — the one who wrote the short poem that’s been in the sidebar of this blog for the past three weeks — took us church hopping. 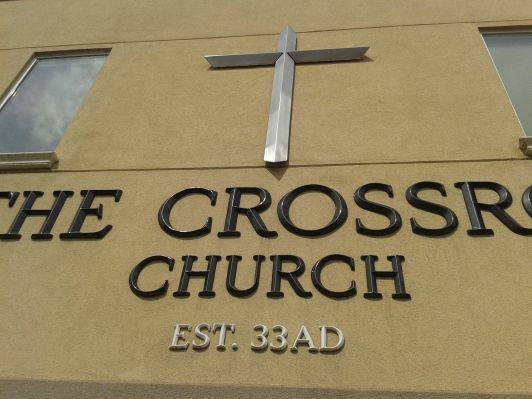 It was a storefront church in the central business area of a smallish town. There, we participated in a most unusual communion service. The elements — the bread and juice — were placed on a table in a self-serve style. Nothing unusual so far, right? But to get to them you walked behind a curtain, single file, one at a time. Suddenly, you were in there, all alone, just you and God. Others were waiting and they joked ahead of time that they’d ‘tie a rope to your feet and pull you out if you stay too long,’ but you had these brief seconds to enter into the ‘Holy of Holies’ and express to God in a whispered prayer whatever you would say to Him, or listen to whatever He would say to you. But you did have those few seconds, and I found it rather awe-inspiring. Your relationship to Christ cannot be expressed in terms of a relationship to a Church or study group; neither can it be defined in terms of your place in a biological family. Maybe your pastor is amazing, but he will have to give his own account to God, and you will have to give yours. Maybe all your life you’ve wanted to be part of something larger, but again, your spiritual life can’t be defined in terms of membership in a group. Or maybe you need your own personal ‘Holy of Holies’ experience to remind you that it’s God that’s amazing. I give my name and tell them I’ll come by to pick it up in 30 minutes. And then I hang up. I have no idea who took my order. I have no idea if they’re busy or if I’m the first customer of the day. I don’t really know if the person who I will be served by is even the same person I just talked to. And honestly, in a busy world, I usually don’t care. Are our prayers to God any different? People talk about having a “laundry list” of prayer requests, but I prefer to think in terms of ordering Chinese food or a pizza. Phil 4:19 (NLT) And this same God who takes care of me will supply all your needs from his glorious riches, which have been given to us in Christ Jesus. God wants us to bring our needs to Him. He loves it when we ask. He wants us to keep the conversation going. He wants us to be in relationship with Him. He promises to meet us in the area of provision. I don’t for a minute believe it works that way. The point is, that we don’t spend 70% on concerns that would fit the patter of prayer toward God, in fact we don’t even spend 51% (using the 17% figure above) or 50%. We tend to spend all our prayer time on ourselves. That a lot more than the 17% that would put things in proportion. And we often want our order ready for pickup in 30 minutes. Matt 6:33 But seek first his kingdom and his righteousness, and all these things [i.e. 31..What shall we eat?’ or ‘What shall we drink?’ or ‘What shall we wear?’] will be given to you as well. Now for the hard part: Lately we’ve had a number of people voice prayer requests that are not prayers for ourselves. We have friends who need a healing touch. We have friends who need jobs. We have friends whose marriage is in trouble. We’ve sensed — and commented to others — that our prayer list has gotten very long lately. So surely, this does not apply to altruistic prayers like we’ve been praying, right? I think the principle still applies. I need to be challenged to spend more time working on the part of the model prayer that concerns thoughts toward God. I need to begin my prayer in worship and reverence. I need to pray for the extension and raising of God’s Kingdom. I need to spend more time praying for God’s will to be done on the earth. A ‘laundry list’ is a ‘laundry list’ no matter how you frame it. God wants my prayer life to be so much more, even when I feel that bringing needs on behalf of others. If it looks like a take-out order, and it sounds like a take-out order, it’s probably a take-out order. God wants me to spend time with him beyond voicing specific need-based prayer concerns. God, help me to spend more time letting you know that I love you, and that I am in awe of your greatness and majesty and dominion. Help me to be more concerned that Your Will be carried out on the earth. Make my desire that You build your kingdom.